An area stretching from Conway, N.H., into western Maine has seen 5 to 6 inches of rain. PORTLAND — The National Weather Service says widespread showers and thunderstorms across northern New England have led to minor flooding and some areas reporting more than 4 inches of rain. Forecasters say heavy rain has been falling across the region Monday, with off-and-on showers and thunderstorms expected through the rest of the day. Flash flood watches are in effect across the area until midnight, according to the National Weather Service in Gray. Weather service meteorologist Tom Hawley says radar indicated that 5 to 6 inches fell Monday morning in an area stretching from roughly Conway, N.H., into western Maine near Bethel. The weather service says early rainfall reports show that 4.6 inches had fallen in Pownal, with nearby Freeport reporting nearly 4 inches. In New Hampshire, Intervale and Dunbarton each reported 3 inches or more. Flash flooding was reported in Intervale and Bethel. 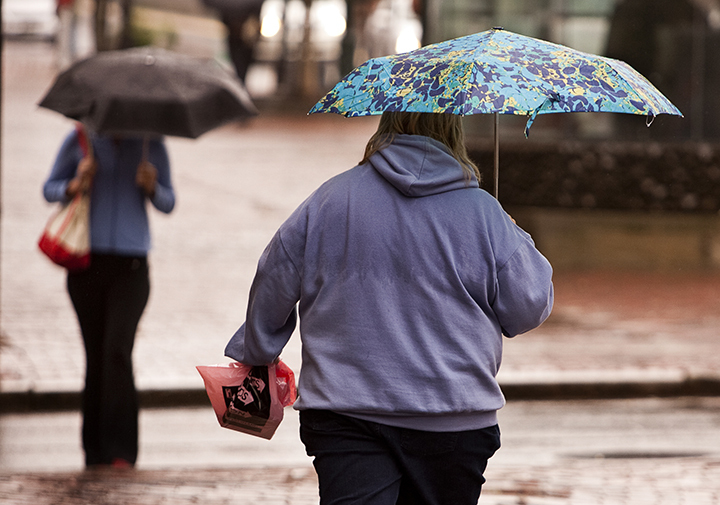 James Brown, a meteorologist with the weather service, said most areas of Maine received at least 1 to 3 inches of rain Monday morning, but those totals could rise to 4 inches or more by the end of the day. He said motorists should be cautious as the heavy rain could lead to road washouts.